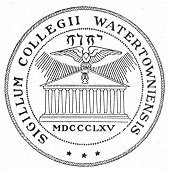 The Northwestern College seal bears the date MDCCCLXV and reads” Sigillum Collegii Watertowniensis. A Greek temple takes up the center of the design and above its columns appears a dove, a sheaf of rays emanating therefrom, the whole being surmounted by the one word JEHOVAH in the characters of the original Hebrew. A classical education of universal scope based on a thorough knowledge of the ancient languages was the goal of the school.